Comex, the creator of hacker important as Spirit or JailbreakMe jailbreaks 2.0, has announced that it no longer works at Apple. A year ago Apple was hired as an intern to provide security for iOS, seeing it was a jailbreak eminence and holes in iOS was everywhere. Nicholas Allegra aka Comex said on Twitter that Apple sent an email to extend his contract as manager, but he forgot to answer it, and therefore no longer works for Apple. 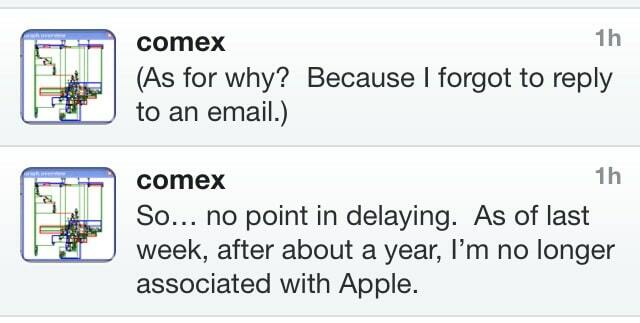 Some have interpreted this to mean that Apple has fired, personally I do not understand well, I guess that Comex has shown no interest in continuing to work there, because otherwise even forget you can always answer the email talk later right? For me one of the best hackers that has passed through the scene, and a shame, because after working in security specializing in Apple iOS and knowing many secrets rededicating themselves unable to jailbreak anymore. Hopefully as more figures this out soon. Article Comex is no longer with Apple has been originally published in News iPhone .